One of the things that I've found when working with my Y5 group is that they need lots of opportunity to actually draw their maps and use the drag and drop features of the software. An internet based programme that I've also been using to explore the children's local area (and one that will zoom out to the wider world) is called Quikmaps - the children have loved being able to zoom in really close and see the detail of their local area. We have been using the Hybrid view which allows us to see the aerial photograph + some street names. Not all areas of the world will be displayed at the same resolution. I think we are quite lucky in south and west Yorkshire that the Google aerial imagery is high resolution which means we can see lots of detail on the ground. 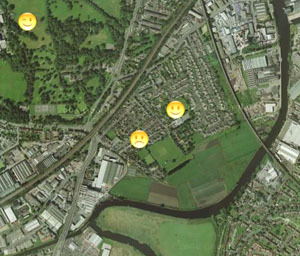 Next week I am going to get three children to create a similar Quikmap of their local area based on the children's `feelings' about their own locality. They will gather statements from the other children in the class and compile a class map while the rest of the class are completing their Local Studies project of the school grounds. In order to incorporate photographs you need them stored on an online gallery. I use both Picasa (Google) and Flickr (Yahoo).